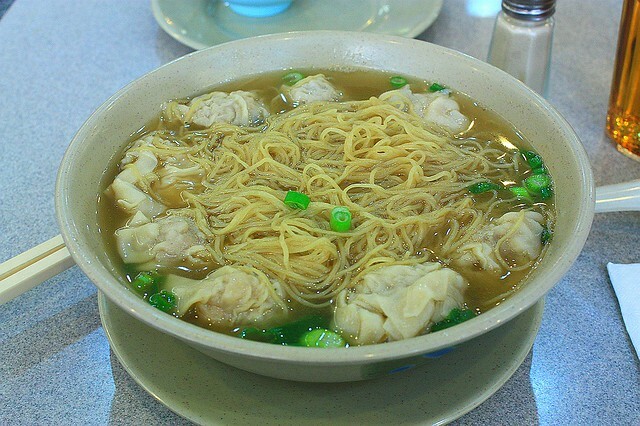 I was born and raised in Vancouver, Canada, and to this day, one of the favourites is wonton noodle soup. As some have written, wonton (Cantonese style) is comfort food. When a wae lad was I, we’d all pile into Hon’s Won-Tun House, a little place on Main Street in Vancouver’s Chinatown. Back then, I could only finish one bowl of wonton noodle soup, but now, I’m always tempted to get a second bowl. It’s a simple meal, composed of steamed egg noodles, morsels of perfectly seasoned pork and shrimp wrapped in a delicate rice-flour wrapper, chopped bits of green onion, all swimming effortlessly in a light flavourful broth. To me, consuming “wonton” has always been like the direct meaning : “swallowing (little) clouds”. Problem is there’s so much more on the menu than just wonton noodle soup. 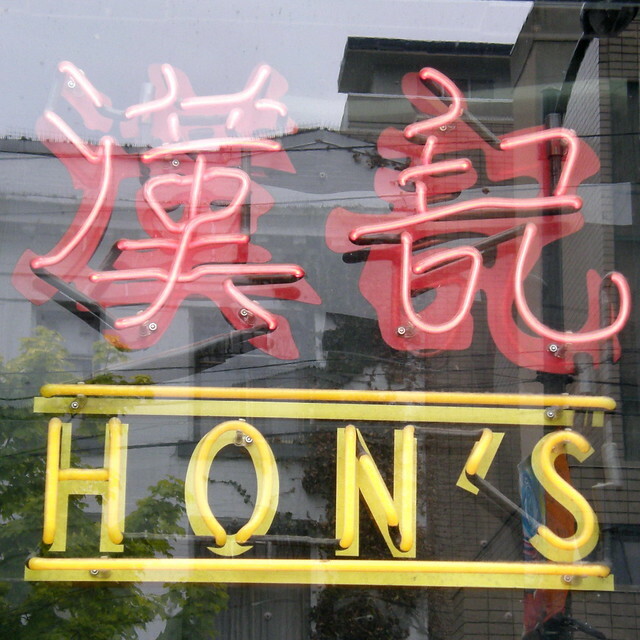 Hon’s has expanded, and as of writing, they now have four locations throughout the greater Vancouver area. In recent trips to Vancouver, I’ve been going to their downtown location on Robson St. As strong the pull of the wonton is, I’m always craving for some dim sum. On this May (2010) visit, I walked in the door at about 1pm, when most of the lunch-rush had dissipated. Many tables were occupied, but there were plenty of available tables, too. Within five minutes of being seated, I ordered wonton noodle soup and two well-known dim sum choices. Signage at Robson Street location : courtesy of Nemo’s Great Uncle (Maynard) on Flickr. Wonton noodle soup with the minimum six morsels of goodness. 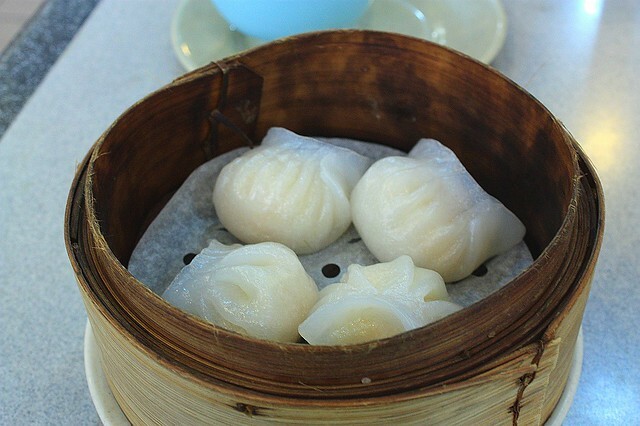 Har gau (shrimp/prawn dumplings). I could eat this all day. 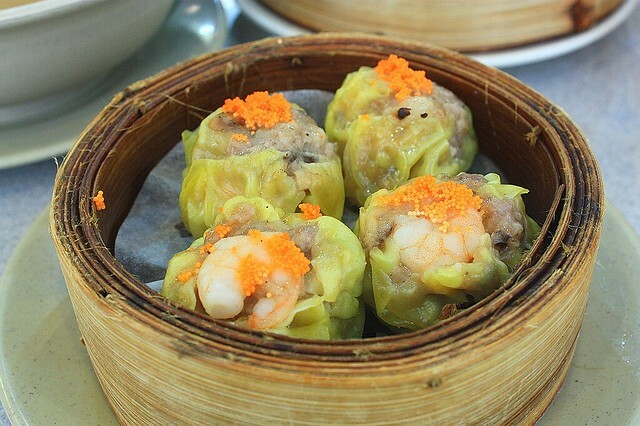 Pork siu mai dumplings, topped with shrimp and fish roe. Still with the all-day eating. These three are childhood favourites, and it’s easy to go back to these whenever possible. If you order in English, you’ll get standard service. But if you order in Cantonese, you get better service. It’s not entirely fair, but that’s what it is. On the other hand, if you flub an order or your Cantonese comes out crappy, you may get service that borders on “inattentive”. I suppose if I turned around and cursed in German, it might still be unimpressive. Verdammt nochmal! But ultimately, the formula is very simple. If it’s a cold wet day outside, get yourself into a steamy noodle joint, and order (wonton) noodle soup. The solution is equally direct. Slurp, chew, munch, aaaaah : relish and repeat. Except for the photo of the window sign, I made the remaining photos on 4 May 2010. This post is published on Fotoeins Fotopress on fotoeins.com as http://wp.me/p1BIdT-13H. No Connection, Unpaid, My Own Opinions. I have not received any compensation for writing this content and I have no material connection to Hon’s or to the city of Vancouver. In Vancouver’s Chinatown, my sister and I grew up with Toi-Shan (or Taishanese) at home and Cantonese out on the streets. Thanks for commenting and for stopping by my blog! Wow – what great wonton memories – and a Chinese restaurant that should really be appreciated. Thanks for your comment and for stopping by to read my blog! You make me want to go back to Hong Kong where I had all these goodies. Wouldn’t it be fun to do a trip to cover some of the “best wonton noodle soup” with back-to-back trips to Hong Kong, and the Chinatowns in Vancouver, San Francisco, Toronto, New York City, and Sydney? 🙂 Of course, after all these trips were done, one would have to go back and do it all over again, because the “best place” in any Chinatown can change very quickly – such is the fickle nature and palate of the discerning customer. I love wonton soup, thanks for sharing this place. There’s so much selection in Vancouver it makes it hard to know where the good places are to go. That’s so true – there’s so much high-quality Asian food that it’s very hard to keep track. I honed on in Hon’s in my post, because I remembered the place as a boy, and the place hasn’t disappointed whenever I’ve been back. I’ll visit Hon’s again in January when I’m ‘home’ for a month. I hope you can get some wonton soup soon. I’ve not been able to find a decent wonton soup in Munchkin (or in the `Schland for that matter) – if you find that magical place of goodness, I’d certainly like to know, too! Yes I do! I haven’t been Hon’s for ages, your post made me so hungry though I just finished my dinner…pics look so yummy. Hi! Interestingly, as I write, I’ve just come back from Hon’s on Robson for a bowl of wonton noodle soup (and the bbq-pork rice plate to go). And yes, the noodles and wonton were delicious. p.s. I also went to your website; I may be in touch with you soon about a short-term rental.